The Pere David's deer weighs 150 - 200 kg (330 - 440 lb). Its original habitat is thought to have been swampy, reed-covered marshlands. It is a grazer, eating mainly grass which it supplements with water plants in the summer. Unlike most deer, the Pere David's deer likes water and swims well. 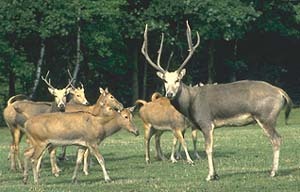 The Pere David's deer originally occurred in northeastern and east-central China, but it apparently became extinct in the wild at least 1000 years ago. Hunting is thought to have been the main reason for the original decline of the wild Pere David's deer. It survived in parks, and in the 1800's a French missionary and naturalist, Father ("Pere" in French) David, observed the animals in the last remaining Chinese herd. Word of this aroused great interest in Europe, and subsequent efforts resulted in a number of these animals being sent to Europe. The remaining deer in China ultimately perished in the early 1900's, mostly due to floods and the unrest during the Boxer Rebellion. 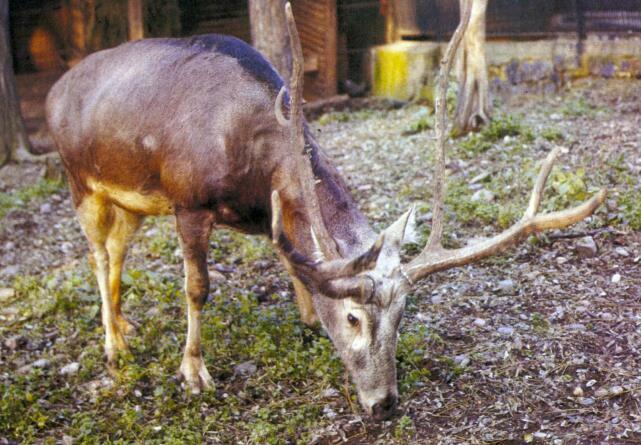 In the late 1980's, a number of deer were returned to China and re-introduced to the wild in China's Dafeng reserve. They have successfully reproduced. *** Although the species is recovering from a very small population, it appears that it is not suffering from the serious genetic defects that can sometimes affect small populations. 2004: Occurs in China (re-introduced) (IUCN 2004). 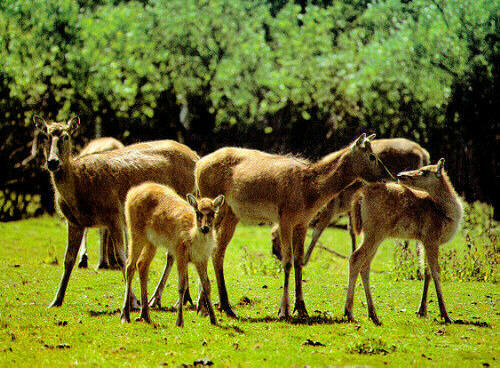 The Pere David's deer originally occurred in northeastern and east-central China, but it apparently became extinct in the wild at least 1000 years ago. It survived in parks, and in the 1800's a French missionary and naturalist, Father ("Pere" in French) David, observed the animals in the last remaining Chinese herd. Word of this aroused great interest in Europe, and subsequent efforts resulted in a number of these animals being sent to Europe. The remaining deer in China ultimately perished in the early 1900's, mostly due to floods and the unrest during the Boxer Rebellion. As a result, all surviving animals descend from the captive deer sent to Europe. In the late 1980's, a number of deer were returned to China and re-introduced to the wild in China's Dafeng reserve. They have successfully reproduced. Hunting is thought to have been the main reason for the original decline of the wild Pere David's deer. The Pere David's deer weighs 150 - 200 kg (330 - 440 lb). The Pere David's deer's original habitat is thought to have been swampy, reed-covered marshlands. 1 or 2 fawns are born at a time. At least 23 years (in captivity). The Pere David's deer is a grazer, eating mainly grass which it supplements with water plants in the summer. Unlike most deer, the Pere David's deer likes water and swims well.